Not to be confused with Goldstream, British Columbia. Coldstream is a district municipality in British Columbia, Canada, located at the northern end of Kalamalka Lake in the Okanagan Valley. Incorporated on December 21, 1906, Coldstream celebrated its centennial in 2006. The municipality is directly southeast of Vernon and is considered part of Greater Vernon. 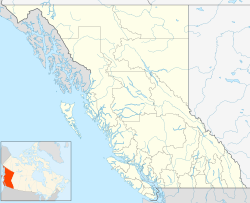 It is a member municipality of, and also the location of the head offices, of the Regional District of North Okanagan. Coldstream is known for the Coldstream Ranch, established in 1863 by Captain Charles Frederick Houghton. He transferred the ranch to Forbes G. and Charles Albert Vernon who in 1891 sold it to John Hamilton-Gordon, 1st Marquess of Aberdeen and Temair, future Governor General of Canada (1893–1898). The ranch was purchased by its current owners in 1994 and continues to be a working cattle ranch. Coldstream is governed by a seven-member council, led by Mayor Jim Garlick. The Member of Parliament is Mel Arnold (Okanagan—Shuswap) and the Member of the Legislative Assembly is Eric Foster (Okanagan-Vernon). The Greater Vernon area was once based in forestry and agriculture. However, manufacturing, retail trade and services are now the primary industries. A suburban community known as Middleton Mountain is located in Coldsteam at the north end of Kalamalka Lake. Covered by School District 22 Vernon, Coldstream is home to Coldstream Elementary School, Kidston Elementary School and Kalamalka Secondary School. The municipality is served by the Vernon campus of Okanagan College. Coldstream has a dry - almost semi-arid climate - with hot sunny summers and cool cloudy winters. Coldstream is home to Kal Beach, which is located on the shore of Kalamalka Lake. Smaller beaches in the area include Kirkland Beach, Juniper Beach, Tamarack Beach, Long Lake Beach, Jade Bay Beach, Cosens Beach, Pebble Beach, and Cliff Beach. Coldstream borders on Kalamalka Provincial Park, which features numerous groomed hiking trails, scenic views, and natural areas. Wildlife in the park includes black bear, whitetailed deer, rattlesnake, marmot, and other creatures. The Silver Star Mountain Resort, 29 km (18 mi) northeast of Coldstream, offers various options for winter sports. ^ "Historical Municipal Census Data: 1921–2011". BC Stats. Retrieved August 25, 2013. ^ . Environment Canada. Accessed 15 February 2012. Thomson, Duane (March 4, 2015) [November 28, 2007]. "Coldstream". The Canadian Encyclopedia (online ed.). Historica Canada. Ormsby, Margaret A. (1990). "Houghton, Charles Frederick". In Halpenny, Francess G (ed.). Dictionary of Canadian Biography. XII (1891–1900) (online ed.). University of Toronto Press.